Apple Photos vs Google Photos: Which Photo Organizing App is Better? When it comes to compare Apple Photos with iPhoto, it's not tricky for you to make a choice because they are largely identical but with minor differences. When it comes to compare Apple Photos with Google Photos, thing becomes much more complicated since there are great differences between Apple Photos and Google Photos. They're specific in platforms, price, main features and photo editing functions. And here in this post, we'd like to elaborate their differences in detail. We'll feel very glad if something in this post is helpful for you. Both Apple Photos and Google Photos are great. But they can't transfer photos from computer to iPhone iPad. MacX MediaTrans just happens to make up for it. Backup iPhone photos to macOS; add Mac photos to iPhone; delete pictures. Transfer music, video, iBooks, iTunes purchases, etc. between iPhone iPad and PC. Create/edit/delete files & playlist; make iPhone ringtone; use iPhone as USB drive. Remove DRM from iTunes purchases and convert M4V to MP4, M4B/M4P to MP3. Apple Photos, no need to further explain, is exclusive to Apple ecosystem. That's to say, Apple Photos can be available only on macOS, iOS and iCloud on web. There is no Apple Photos for Android users. As for non-Apple device users, you can use iCloud for Windows to download and upload images thereon. Compared with Apple Photos, Google Photos is seemingly much more compatible in platforms. Generally, you don't have to download Goolge Photos, cuz you can directly use it online on the site of photos.google and it's available to access on any browser. In terms of mobile users, just go to Google Play or App Store to free download Google Photos app to backup and view images on Android and iPhone iPad. As far as platforms are concerned, it mainly relies on the devices you use. If you use Apple devices like iPhone iPad and Mac computer, you're probably happier using Apple Photos and its built-in iCloud Photo Sharing. If you're a loyal fan of Android devices, Google Photos is more suitable to you than Apple Photos. Apple Photos for iOS or macOS allows you to store as many as photos you want for free provided your iPhone iPad and macOS have enough space to save them. Yet, your iPhone iPad accidents always caught you off guard. You have no time to backup your photos before your iPhone iPad stop working. To avoid this problem, Apple offers you another service iCloud Photo Library, which enables you to real-time backup photos to iCloud on iPhone iPad or macOS via your Apple ID. There are 5GB for free to use on iCloud storage. If your have saved hundreds of photos on iOS devices, you need to upgrade iCloud storage plan, 50GB at $0.99 per month, 200GB at $3.99 per month and 1TB at $9.99 per month. Google Photos also has no limits on storage space as long as your Android or iOS devices have extra space to save photos. Yet, different from Apple Photos, Google Photos sets the rules on the photo size and video resolution: 16 megapixels for pictures and 1080p for videos at the most. Of course, you have another option if you wanna save the original photos and 4K 2160p videos. That is using Google Drive. 15GB free storage is available for everyone on Google Drive and $1.99 is charged for 100GB a month. On top of the cloud storage service price, there are other charging items. In Apple Photos, if you need to turn photo collects into Book, Card, Calendar or Prints, you need to pay for these projects. Compared with Apple Photos, Google Photos has less fee for service, only Photo Books left. Certainly, they have different charging standard on these projects. Below we use side-by-side comparison way to present the price list, with a wish to help you know the gaps at a glance. 1. Three options for Books: softcover, square hardcover and classic hardcover book, pricing from $9.99 to $49.99. 2. Price tag at $19.99 for 13x10 inches Calendar for 1 year. 3. 4x6 inches and 5x7 inches Cards cost at $0.99, $1.49 and $2.99. 4. The price of Prints is based on picture size and quantity. 1. Two options for Books: $9.99 for 7-inch softcover book and $19.99 for 9-inch hardcover book. 2. No more other charging projects. Photo Organization: this top photo management software helps you better organize and manage your photo library via its various categories including Moments, Collections, Years, Shared, Albums and Projects. Photo Transfer: Apple Photos allows you to free import pictures from iOS/Mac to Apple Photos and also export photos to MacBook/iMac after editing. Photo iCloud Storage: the built-in iCloud Photo Sharing feature is aimed to let you upload photos to iCloud for real-time syncing to iCloud service. Photo Sharing: 1 click to share image to AirDrop, iCloud, Mail, Messages, as well as Facebook, Twitter, Flickr, etc. 3rd party extensions. Photo Editing: dozens of photo editing features are available. Manage Photos: it features four main categories to manage photos: Photos, Album, Sharing and Archive. Import/Export Photos: Google Photos gives users much freedom to just drag-and-drop pictures to Google Photos. And after image editing, it offers you more options to download photos to Mac, Windows or mobile device. Photo Google Drive Storage: similar to Apple's iCloud, Google Drive is also used for real-time cloud photo backup. Photo Sharing: different from Apple Photos, Google Photos lets you share photos mainly to your friends via Google+ contacts and E-mails, no FB, Twitter alike. 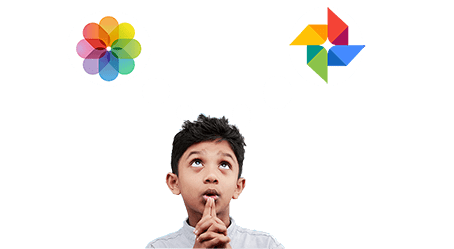 Photo Editing: when it comes to compare Google Photos with Apple Photos in editing tools, Google Photos is overshadowed by Apple Photos. Though the result is known by you, we still take out photo editing tools for a detailed comparison in the following section. 1. Color Filters: 14 colors are available, original, auto, west, palma, metro, eiffel, blush, modena, reel, vogue, ollie, bazaar, alpaca and vista. 2. Basic adjustments: use the slidebar to adjust light, color and pop. 3. Crop: remove unwanted parts of image to adjust photo aspect ratio with 6 options, Free, Original, Square, 16:9, 4:3 and 3:2. 4. Rotate: rotate photos in counter-clockwise at 90/180/270 degrees. 1. Enhance: intensify the whole effect of the picture. 2. Rotate: rotate picture in counter-clockwise. 3. Crop: adjust picture size, width and length. 4. Filters: 8 special effects: Mono, Tonal, Noir, Fade, Process, etc. 5. Adjust, Retouch and Red-eye. Note: Both Apple Photos and Google Photos are one of the greatest photo organizing software to let you organize photos, videos and edit photos. However, if you wanna use it to edit your videos on macOS, you will get nothing but failure. Good news is that there are an expansive library of excellent Photos alternative like MacX Video Converter Pro armed with video editing feature to satisfy your needs. MacX Video Converter Pro is a professional video converter, video downloader, slideshow maker, as well as a video editor to help you adjust and reduce video size with 20%-90% size off, delete black borders off video, trim video to free adjust video Start/End time, rotate video 90/180/270 degrees, add SRT subtitles to video, add watermarks to video, change video aspect ratio 4:3 to 16:9 or vice versa, tweak video resolution 720p, 1080p, 4K 2160p, adjust video bit rate, split video, merge videos into one, etc. MacX MediaTrans is the best iPhone backup app that lets you to bulk transfer and backup photos, music, video, iTunes purchases, ringtones, iBooks from iPhone to Mac/PC and vice versa. Thus, you can update to iOS 11 on iPhone iPad without worrying about data loss. iPhoto Not Working on macOS (High Sierra)? Solutions Here!